Breaking down language barriers should rest firmly on top of any driven expatriate’s to-do list. Communicating effectively with your new colleagues is the only way to ensure a smooth expat transition in to your new place of work, and your new home. Learning the language of your new home is incredibly important, as it will enable you to fully integrate into your new surroundings. In the workplace, being able to communicate effectively is vital, for obvious reasons. Luckily for British expatriates, English is the most widely used business language throughout the world . However, even in an English speaking office, confusion could arise. Even though English will be widely spoken, it won’t necessarily be spoken the same way you are used to back home, and in many cases you will have to decipher many unique-to-the region turns of phrase. Another thing to bear in mind is the manner in which we use the English language can have many slight nuances that can drastically alter what sounds like a pretty basic sentence. 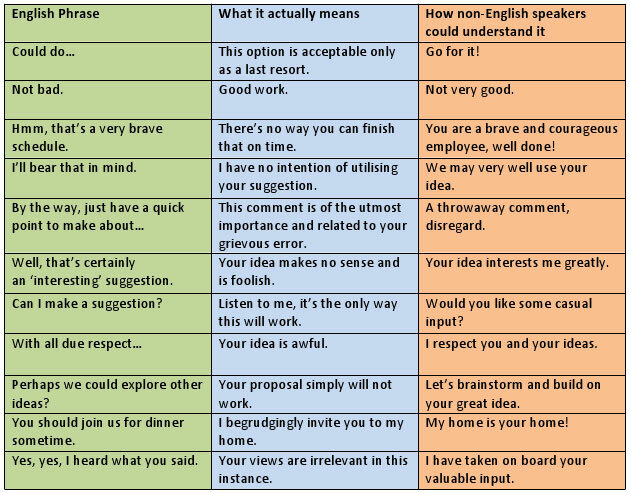 Here’s a handy cut-out-and-keep guide to some of the differences between what we English people say, what we actually mean, and how a non-English speaker might interpret them.